PAN India high speed 3G service providers BSNL has slashed the base voice call rate of Prepaid Mobile plans in November, 2015 under GSM Mobile services. State runs Telecom Company Bharat Sanchar Nigam Limited (BSNL) has reduced the existing basic call rate of Prepaid plans in all Telecom Circles. 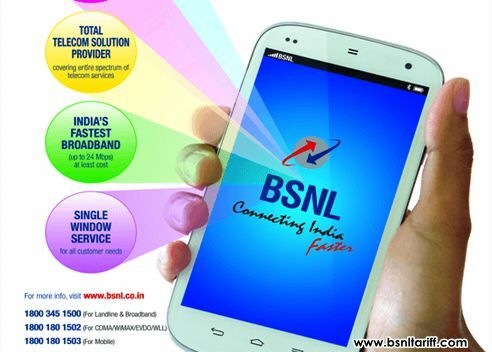 As per the latest information from BSNL sources, to compete with private telecom companies BSNL has decided to slash base voice call tariff of PER SECOND and PER MINUTE prepaid plans to grab more new mobile connections. These slashed voice call tariff will be applicable to customers from MNP (Mobile Number Portability / New connections for a period of 60 days on promotional basis. New / MNP customers under PER SECOND Prepaid plan can enjoy reduced call tariff of 1ps per 3 seconds to On-net and 2ps per 3 seconds to Off-net. Whereas, customers under PER MINUTE Prepaid plan can enjoy reduced call rate of 10ps per minute to On-net and 30ps per minute to Off-net. The reduced call tariff will be applicable with Per Second Plan Rs.106 and Per Minute Plan Rs.107 for New customers only including MNP customers. The slashed call rate offer will not be extended for subsequent recharges i.e migration or validity extension with plan voucher (per second and per minute plans). The reduced call rate will be applicable for initial 60 days for new customers (including MNP customers). The above reduced call rate will be implemented with effect from 09-11-2015 on PAN India basis. All other terms and conditions will be the same. Dear reader/subscriber, if you really enjoyed with our article then don’t forget to subscribe to us or share your views and opinions on Comment box or Facebook. We always value your suggestions and encourage us to share more information on this desk.